No, this isn't a post about ghosts and goblins, or anything supernatural. Or even writing about those things. It's a post to say goodbye to someone who has shared my life for nearly twenty-two years. I adopted her just after she was born to one of the many stray cats who often visited a friend's house. For whatever reason, they seem to congregate there. When she was old enough to walk, she would take off running full-throttle towards anything that caught her eye. She wasn't quite as adept at stopping, hence the name. I didn't think she would be around for as long as she was. Most cats do well to live 15 to 18 years. But Bumpers had a heart murmur that had the vets worried. Surely she could not be expected to live that long. So, over fifteen years ago, she started on medicine to control her blood pressure. Somewhere along the way, we added supplements to help protect her kidneys. Ten years came and went. Then fifteen. Then twenty. In December, her check-up showed her kidney values were starting to elevate. We made some adjustments. A couple of weeks ago, she suddenly stopped eating. That's not a good sign in a cat, and quite unlike Bumpers usual behavior. When I picked her up, I could tell she'd lost weight. It was time for a midnight visit to the emergency animal hospital. She was there four days to get her stable. I was sent home with a bag of Ringer's Lactate and some very large needles to inject subcutaneous fluid to keep her hydrated. When she didn't respond well, I took Bumpers to her regular vet (I'd already made a follow-up appointment). They decided to increase the amount of fluids, give an appetite stimulant, and do blood work. It gave her a boost, but it didn't last. Back to the vet we went. They took her in again to monitor her and give fluids. In spite of their efforts, Bumpers passed away early this morning, peacefully, while sleeping. 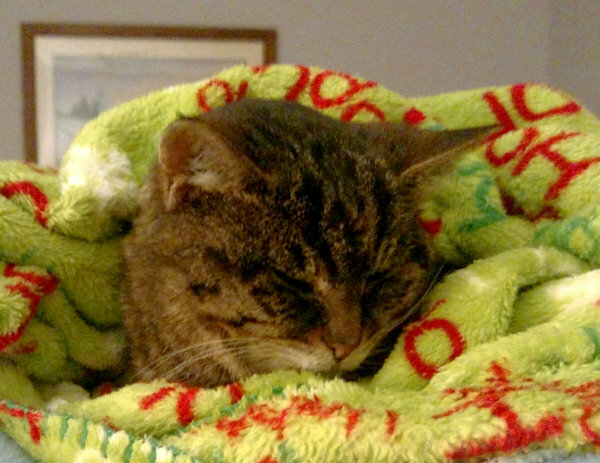 Many older cats succumb to renal failure, and this was what took Bumpers. It wasn't unexpected at her age, but the house sure seems empty now. I still have other cats in my life. There's Elias and Emilee, but even adding their ages together doesn't equal the time I've spent with Bumpers. And there's always Purple, the orange-colored cat of a neighbor. No, I don't know the story behind that name. There are more than enough animals prowling about. But Bumpers will be missed.